Premium electronic bidets offer the kind of creature comforts that make it feel like an amenity in some science-fiction movie. With heated seats, a never-ending supply of warm water and massaging features, an electronic bidet fosters the kind of convenience we’ve always imagined technology can get us. Still, there are good reasons for ditching the high-tech in favor of bidets that don’t require an electric plug. 1. It’s cheaper. 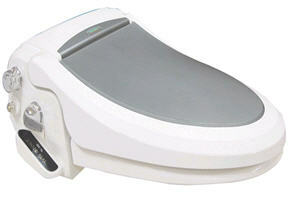 Electronic bidets can easily run you up to $500 or more. Regular bidets, on the other hand, can cost as low as $50. The price gap is huge and, if you don’t want to make that kind of investment for a simple bathroom amenity, a vanilla version should make a decent choice. 2. It’s more green. Since you’re not using electricity, your home’s overall resource usage is much lower. As such, your carbon footprint is similarly less pronounced. 3. It reduces toilet paper use. Since you no longer need toilet paper for wiping dirt and stains off, you’ll only need toilet paper to pat yourself dry. If you want to further eliminate toilet paper use, you can also opt to just dry yourself with a small towel. 4. You can get hot water with a regular bidet too. While a water heating technology doesn’t come with non-electric bidets, some units allow you to switch between two water sources, allowing you to connect one hose to your water heater (the same one that heats your shower, for instance). 5. Less maintenance required. As with any electronic gadget, the less parts it has, the less problems you’re likely to get. A regular bidet is simpler, allowing for fewer things to possibly go wrong. One Comment on "Five Reasons To Choose A Non-Electric Bidet"
With a regular bidet you have to WAIT for the hot water to come up, you have to keep adjusting it. The bidet takes up a whole lot of room. Regular full bidet has to be installed by a prof plumber. WAY MORE EXPENSIVE than buying an electronic seat for your regular toilet seat. It has to be mounted in the floor with a waste water drain. They both have to be connected to the water supply (Same) but the electronic only needs cold water which you easily connect to the water tube going to the regular toilet, they come with a adapter.